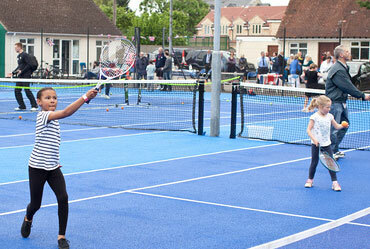 Mini Tennis is a great introduction to tennis for children from 4 to 11 years old. The game is adapted with slower balls, smaller courts and smaller rackets in order to allow progression. The approach is tailored by age and physical development and allows children to develop many skills and techniques at an early age. Mini Red is for ages 8 and under. Mini Orange is for players aged 8 and 9. Mini Green is for players aged 9 and 11. For coaching times see our 'Club Sessions' page.